Use this waterproof pouch for carrying and storing food, snacks, makeup or even use it as a clutch purse or a dopp bag. Eco Friendly, all natural, anti-bacterial and safe for storing food. Makes a great wet bag too! The fabric choices are Charcoal Grey, Olive Green or Brown Canvas with an unbleached cotton lining, comes with a handsome brass zipper. 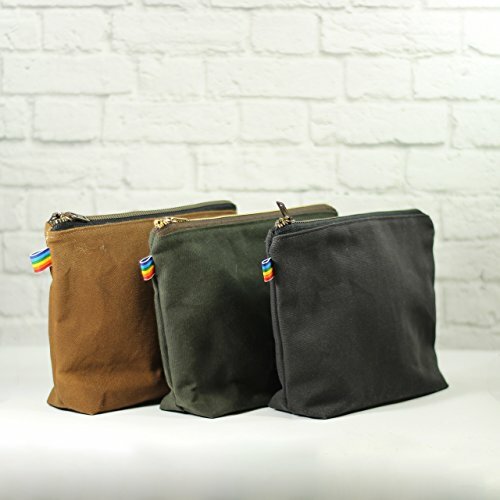 This pouch measures 9" X 5.5" X 2"
Classic designs and bold colors come together with the natural antibacterial properties of beeswax to protect your fabrics from germs and moisture and give you a natural alternative to plastics and synthetic fibers. Our Bags are well made and will last you a very long time! No chemicals, only all natural ingredients go into making each and every one of our bags. If you have any questions about this product by RainbowBee, contact us by completing and submitting the form below. If you are looking for a specif part number, please include it with your message.